Mike Homyak Receives WUMFA National Services Award The 2017 Wisconsin & Upper Michigan Florists Association National Services Award was presented to Mike Homyak, Jr. at the annual WUMFA convention. It is given to a member who provides outstanding service to the floral industry. 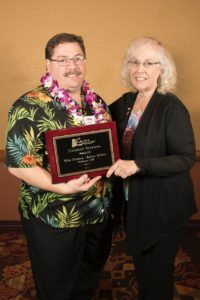 Homyak, a Reliant Ribbons representative, grew up watching his father visit floral shops, trade shows and state conventions throughout the Midwest. He is know for his reliability, prompt delivery of orders, and willingness to connect florists with other vendors if he can not satisfy their needs. He supports WUMFA classes and the convention with product donations and his enthusiasm for the industry. He is great at networking and keeping in touch with the latest trends.